I chose this picture of my long lost friend Ellen Gallant so that perhaps through the miracle of the internet, we might reconnect. 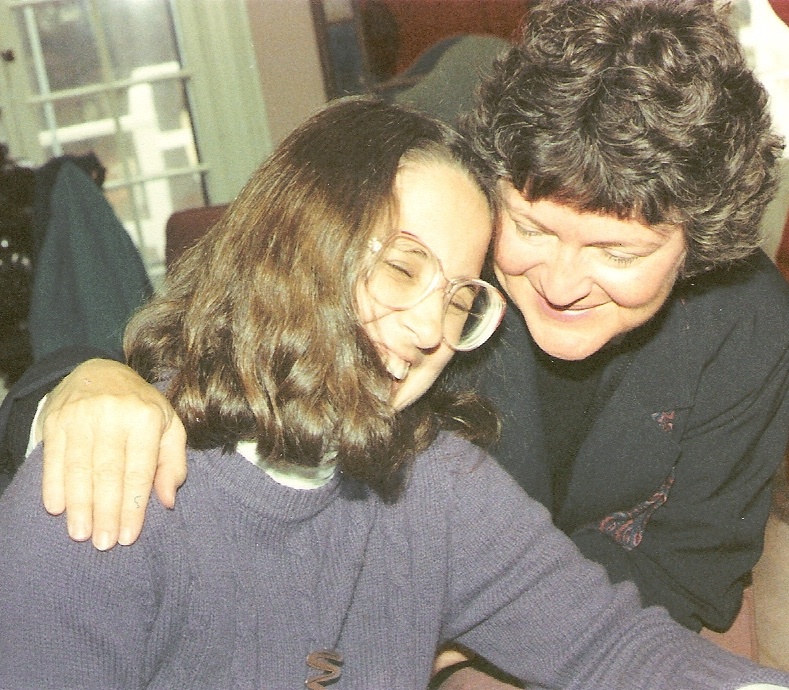 She is seen here with our wonderful Dean Bonnie Leonard at Wellesley College. I don’t know where I stand on the nature vs. nurture debate, nor do I really care. I am who I am and that is enough for me. If that’s not good enough for you, I simply don’t need you in my life. As a teen and young adult I didn’t know I was a lesbian. Although I’d heard the word and could certainly define it, I really couldn’t comprehend what that meant. I didn’t dislike boys, in fact I can still name a few who were always very special to me (some of whom still don’t know how much!) If asked about romantic attractions, I would have named a boy or two, but it was just that – romantic, in that high school girl kind of way. But I felt somehow more stifled in my friendships with girls – as much as I loved my girlfriends, there seemed a need to hold back, some subconscious societal message that I loved them too much. It was only after I came out to myself that I was able to understand how important and special those female friendships were and how it was a stigma that I didn’t understand that had prevented me from enjoying those friendships to their fullest. Isn’t it ironic that I couldn’t fully express my platonic love for my female friends until I learned to accept and express my romantic love for women as well? I’m a touchy-feely kind of person with a sensitive heart. It never seemed awkward to touch, hold hands, hug a male friend. But it did seem awkward to even want to have the same physical friendship with female friends. It was only after coming out that I was able to be freed from this foolishness and recognize not only that there is nothing wrong with women loving women, but what a wonderful and beautiful thing it is. Women have had these deep bonds with each other for millennia – sometimes romantically and sometimes simply as passionate friendships. That liberation of my female friendships has contributed so much to who I have become today. When I’m with a friend who is secure enough in her own identity, I can walk down the street holding hands, arm in arm, or with arms intertwined around each other simply because we enjoy the blessing of sharing this world together. I can tell her I love her. I can hold her hand when she’s afraid, caress her cheek when she’s ill, hug her tight when she grieves. And I can also walk arm in arm with her through the park, caress her cheek when she cries tears of joy, and hug her tight at the first sight of her. How often I’ve walked, arms around each other, laughing and joking, with friends who didn’t think twice about what others might think of them or if I might have a hidden agenda or become overly friendly! I dearly love my female friends. I can find them attractive without be attracted to them. I can hold them close without wanting to sleep with them. And by the way, I can love a man, find him attractive and even hold him close without wanting to sleep with him either! And despite the conservative frenzy over protecting the sanctity of marriage, none of this is a threat to my marriage, or to yours. Reading historical stories of women’s lives, we do know that some of the women in these stories engaged in romantic/sexual relationships with each other but we don’t know that about all of them. Regardless of their romantic or sexual attractions and relationships, these are stories of women who cared deeply about each other. Being a lesbian certainly is about romance and sexuality, but it is not simply that. For some of us, it is also about being free to be whole – to cherish the depths of our female friendships in a way that allows us to be who we are meant to be – human beings fully dependent on our ability to be in relationship with others. Regardless of our sexual preference, we cannot be truly whole nor can we even survive if we do not embrace and nurture our ability to develop those caring relationships with those with whom we share our world.